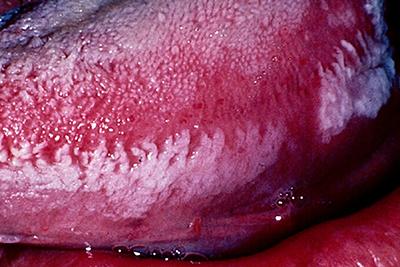 Objectives: Oral hairy leukoplakia (OHL) is caused by Epstein-Barr virus (EBV) and is often associated with HIV and other immunosuppressive conditions. It is rare in HIV-negative patients, but has been reported in patients who use immune-modulating medications (e.g., cyclosporine). The objectives of this study were to determine the occurrence of OHL in HIV-negative patients and report Langerhans cell counts in these lesions. Study design: A series of 7 new cases of OHL among HIV-negative patients is described. Langerhans cells were counted using an immunoperoxidase stain for CD1a and light microscopy. Results: The 7 patients were male, ranging in age from 26 to 69 years. Clinically, all lesions were diagnosed as leukoplakia on the lateral border of the tongue. Microscopic examination revealed hyperparakeratosis and candidiasis in some cases, acanthosis and a band-like zone with clearing of cells in the upper spinous layer, which were EBV-positive by in-situ hybridization. There was a significant decrease in Langerhans cell counts in OHL patients. Conclusion: OHL can occur in HIV-negative patients. Notably, OHL can occur in HIV-negative patients who are not taking immunosuppressive medication or therapy of any form, who are apparently immune competent and who have no apparent predisposition. Although only 8 such cases could be traced in the literature from 1989 to 2015,4,5,7-10 from this body of literature, it is clear that OHL is not limited to HIV-positive or immune-suppressed patients. In this paper, we present a series of 7 new cases of OHL in patients who were not evidently immune suppressed. At the time of presentation, the HIV status of these patients was not known, and they were tested after the diagnosis of OHL was made. Because Langerhans cell numbers have been reported to be lower in OHL patients with AIDs,24,25 we also aimed to determine whether Langerhans cell counts in OHL patients who were HIV negative were different from counts in “normal” control tissues.24 The purpose of this paper is to highlight to dentists that OHL can occur in patients who are not immunosuppressed. Six paraffin-embedded formalin-fixed specimens were retrieved from the archives of the pathology department at the University of Western Ontario and 1 from the College of Dentistry, University of Saskatchewan, for review of the microscopic features and clinical reports. Medical histories were obtained from the pathology requisition forms and the submitting dentist. All specimens were stained with hematoxylin and eosin and periodic acid–Schiff stain (with and without diastase digestion) to determine the presence or absence of Candida albicans and glycogen. The study cases were compared with non-inflamed tongue control cases where only hyperparakeratosis presenting as a leukoplakia was present (normal controls) and HIV-positive, OHL-negative patients who presented with a leukoplakia of the lateral tongue. All tissues were examined for the presence of EBV by means of in-situ hybridization using a standard laboratory protocol (EBV (EBER) PNA Probe/Fluorescein, Code Y5200, and PNA ISH Detection Kit, Code K5201, Dako, Mississauga, Ontario, Canada). The number of Langerhans cells (antigen-presenting cells) was evaluated using a routine immunoperoxidase stain for CD1a (monoclonal mouse anti-human, clone 010, Code IR069, Dako, Mississauga, Ontario, Canada). CD1a-positive cells were counted in non-overlapping, microscopic fields at 200× original magnification and recorded per unit area (mm2) of the squamous epithelium of lesional tissue (n?=?7), normal control tissue (n?=?7) and HIV-positive controls (n =?9). For each case, the entire area of epithelium present was measured, and the average number of Langerhans cells per mm2 was calculated. Cell counts were made by 3 investigators blinded to the histopathologic diagnosis. A 2-tailed unpaired Student t test with Welch correction was conducted on the Langerhans cell counts, using GraphPad Prism 7 (GraphPad Software, La Jolla, Calif.). Statistical significance was set at 0.05. We have read the Helsinki Declaration and have followed the guidelines in this investigation. Approval was obtained from Western University Health Science Research and Ethics Board (HSREB number 105016). All 7 patients were male, median age 51 years (range 26–69 years), and all lesions presented as a white patch on the tongue, all of which healed uneventfully. A?summary of the clinical findings is presented in Table?1. All patients either had a smoking history or other medical conditions, such as diabetes, hypertension, hyperlipidemia and gout (Table?1). Patients were receiving medications for these conditions, all of which were controlled, but duration and dosage were not disclosed. All patients showed similar histopathologic findings (Fig. ?2A), were HIV negative and were positive for EBV detected by in-situ hybridization (Fig.?2C). After diagnosis of OHL, patients were tested for HIV. Because OHL is regarded as pathognomonic for immunodeficiency status,3 in particular for HIV infection, is an AIDS-associated lesion,11 may be an initial indicator of HIV infection13 and also for logistical reasons, as the patients were seen at different offices in areas around the province, a second test for HIV was not completed. In all cases, the clinician reported that the lesions resolved without recrudescence or recurrence and without any additional treatment. The median Langerhans cell count per microscopic field (at 200x original magnification) in OHL, normal control patients and HIV-positive controls was 2 (range 0–36), 6 (range 0–95) and 11 (range 0–61) respectively, considered highly significant (p?<?0.001) (Table?2). Immunohistochemistry for CD1a to identify Langerhans cells is shown in Figures?2E and 2F. Figure?1: Oral hairy leukoplakia of the left lateral border of the tongue, presenting as a white lesion with an irregular, corrugated and “shaggy” surface. Figure?2: Cytology of oral hairy leukoplakia (OHL) in patient?4 (findings were similar in all 7 cases) in A, C and E, compared with control tissue in B, D and F (original magnification ×100). A:?Hematoxylin and eosin stain shows hyperparakeratinized stratified squamous epithelium with surface corrugation, acanthosis and clearing of cells (“balloon cells,” arrowhead) in the upper stratum spinosum. B:?Control tissue shows hyperkeratosis and acanthosis, but no significant ballooning of cells, nuclear margination or beading of chromatin. C:?In OHL patient, in-situ hybridization for Epstein-Barr virus (EBV) is positive in the nuclei of epithelial cells. D:?Control tissue is negative for EBV RNA. E:?OHL is negative for CD1a in this section; no Langerhans cells are present. F:?In control tissue, dark brown immunohistochemical staining for CD1a reveals more numerous Langerhans cells than in OHL cases. Table 1: Clinical description of HIV-negative patients presenting with oral hairy leukoplakia. Table 2: Calculated mean and median values for the Langerhans cell (LHC) counts. Three of the patients reported here had type II diabetes, which was controlled in all cases. When diabetes is not controlled, chronic immunosuppression, delayed healing and/or salivary hypofunction may result in oral mucosal disease.29 At least two studies have found increased EBV DNA and OHL in people with diabetes.4,30 Milagres et?al.30 concluded that EBV infection of the lateral border of the tongue of people with minor immunodeficiency (e.g., pregnant women and people with diabetes) was considerably higher than in healthy people. In HIV-positive OHL patients, the number of Langerhans cells in the epithelium is generally decreased.24 Walling et al.24 suggest that EBV replication is directly responsible for decreased Langerhans cell counts in the oral epithelium in cases of OHL. In our HIV-negative patients, the number of Langerhans cells was decreased in those with OHL lesions compared with control patients. Walling et al.24 found that EBV replication decreases oral Langerhans cell counts independent of HIV infection, which is consistent with our findings in HIV-negative patients. Our patient 6 had a higher Langerhans cell count in an area of epithelium where in-situ hybridization was negative for EBV, but clearly lower in the area of epithelium where EBV was present. In this case, Candida hyphae were also present. In this paper, we describe 7 cases of OHL in patients who were HIV negative and not taking any immunosuppressive medication. It is important that dentists be aware that OHL can develop in those who are not immune deficient and perhaps have “cryptic” immunosuppression (e.g.,?local immunosuppression resulting from inhaled steroids), as suggested by Greenspan et al.13 This is important, as OHL generally develops in a site that is at high risk for epithelial dysplasia and oral squamous cell carcinoma, making accurate diagnosis essential to avoid overtreatment. Dr. Darling is professor, division of oral pathology, department of pathology and laboratory medicine, Western University, London, Ontario. Dr. Alkhasawneh is a general dentist, Forest City Dental, London, Ontario. Dr. Mascarenhas is an oral and maxillofacial surgery resident, McGill University, Montreal, Quebec. Ms. Chirila is a Master’s Student, department of laboratory medicine and pathobiology, University of Toronto, Toronto, Ontario. Dr. Copete is professor, college of dentistry, University of Saskatchewan, Saskatoon, Saskatchewan. Correspondence to: Dr.?Mark Roger Darling, Division of Oral Pathology, Department of Pathology and Laboratory Medicine, Western University, 1151?Richmond St., London ON N6A?5C1. Some financial support for this manuscript was received from a Western University Internal Research Fund held by Dr. MR Darling. Greenspan D, Conant M, Silverman Jr?S, Greenspan?JS, Petersen?V, De Souza?Y. Oral “hairy” leucoplakia in male homosexuals: evidence of association with both papillomavirus and a herpes-group virus. Lancet. 1984;324(8407):831-4. Syrj?nen S, Laine P, Niemel? ?M, Happonen?RP. Oral hairy leukoplakia is not a specific sign of HIV-infection but related to immunosuppression in general. J?Oral Pathol Med. 1989;18(1):28-31. Kreuter A, Wieland U. Oral hairy leukoplakia: a clinical indicator of immunosuppression. CMAJ. 2011;183(8):932. Chambers AE, Conn B, Pemberton?M, Robinson?M, Banks?R, Sloan?P. Twenty-first-century oral hairy leukoplakia — a non-HIV-associated entity. Oral Surg Oral Med Oral Pathol Oral Radiol. 2015;119(3):326-32. Eisenberg E, Krutchkoff D, Yamase?H. Incidental oral hairy leukoplakia in immunocompetent persons. A report of two cases. Oral Surg Oral Med Oral Pathol. 1992;74(3):332-3. Moffat M, Jauhar S, Jones?ME, MacDonald?DG, Felix?DH. Oral hairy leucoplakia in an HIV-negative, immunocompetent patient. Oral Biosci Med. 2005;2(4):249-51. Galvin S, Healy CM. Oral hairy leukoplakia in healthy, immunocompetent individuals. Ir?Med?J. 2014;107(6):179-180. Piperi E, Omlie J, Koutlas?IG, Pambuccian S. Oral hairy leukoplakia in HIV-negative patients: report of 10 cases. Int J Surg Pathol. 2010;18(3):177-83. Felix DH, Watret K, Wray?D, Southam?JC. Hairy leukoplakia in an HIV-negative, nonimmunosuppressed patient. Oral Surg Oral Med Oral Pathol. 1992;74(5):563-6. McMillan MD, Boyd NM, MacFadyen?EE, Ferguson?MM. Oral hairy leukoplakia-like lesions in an HIV-negative male: a case report. N?Z Dent?J. 1989;85(382):121-4. Greenspan JS, Greenspan D, Lennette?ET, Abrams?DI, Conant?MA, Petersen?V, et?al. Replication of Epstein-Barr virus within the epithelial cells of oral “hairy” leukoplakia, an AIDS-associated lesion. N?Engl J Med. 1985;313(25):1564-71. Odumade OA, Hogquist KA, Balfour?Jr HH. Progress and problems in understanding and managing primary Epstein-Barr virus infections. Clin Microbiol Rev. 2011;24(1):193-209. Greenspan JS, Greenspan D, Webster-Cyriaque?J. Hairy leukoplakia; lessons learned: 30-plus years. Oral Dis. 2016;22(suppl?1):120-7. Mendoza N, Diamantis M, Arora?A, Bartlett?B, Gewirtzman?A, Tremaine?AM, et?al. Mucocutaneous manifestations of Epstein-Barr virus infection. Am J Clin Dermatol. 2008;9(5):295-305. Kabani S, Greenspan D, deSouza Y, Greenspan JS, Cataldo E. Oral hairy leukoplakia with extensive oral mucosal involvement. Report of two cases. Oral Surg Oral Med Oral Pathol. 1989;67(4):411-5. Thomas JA, Felix DH, Wray?D, Southam?JC, Cubie?HA, Crawford?DH. Epstein-Barr virus gene expression and epithelial cell differentiation in oral hairy leukoplakia. Am J Pathol. 1991;139(6):1369-80. Braz-Silva PH, de Rezende NP, Ortega?KL, de?Macedo Santos?RT, de?Magalh?es?MH. Detection of the Epstein-Barr virus (EBV) by in situ hybridization as definitive diagnosis of hairy leukoplakia. Head Neck Pathol. 2008;2(1):19-24. Baccaglini L, Atkinson JC, Patton?LL, Glick?M, Ficarra?G, Peterson?DE. Management of oral lesions in HIV-positive patients. Oral Surg Oral Med Oral Pathol Oral Radiol Endod. 2007;103 Suppl:S50.e1-23. Rushing EC, Hoschar AP, McDonnell?JK, Billings?SD. Iatrogenic oral hairy leukoplakia: report of two cases. J?Cutan Pathol. 2011;38(3):275-9. Graboyes EM, Allen CT, Chernock RD, Diaz?JA. Oral hairy leukoplakia in an HIV-negative patient. Ear Nose Throat?J. 2013;92(6):E12. Prasad JL, Bilodeau EA. Oral hairy leukoplakia in patients without HIV: presentation of 2 new cases. Oral Surg Oral Med Oral Pathol Oral Radiol. 2014;118(5):e151-60. Lee KH, Polonowita?AD. Oral hairy leukoplakia arising in an oral lichen planus lesion in an otherwise immune-competent patient. N?Z Dent?J. 2007;103(3):58-9. Miranda C, Lozada-Nur?F. Oral hairy leukoplakia in an HIV-negative patient with systemic lupus erythematosus. Compend Contin Educ Dent. 1996;17(4):408-10, 412; quiz 414. Walling DM, Flaitz CM, Hosein?FG, Montes-Walters?M, Nichols?CM. Effect of Epstein-Barr virus replication on Langerhans cells in pathogenesis of oral hairy leukoplakia. J?Infect Dis. 2004;189(9):1656-63. Daniels TE, Greenspan D, Greenspan?JS, Lennette?E, Schi?dt?M, Petersen?V, et?al. Absence of Langerhans cells in oral hairy leukoplakia, an AIDS-associated lesion. J?Invest Dermatol. 1987;89(2):178-82. Lozada-Nur F, Robinson J, Regezi?JA. Oral hairy leukoplakia in nonimmunosuppressed patients. Report of four cases. Oral Surg Oral Med Oral Pathol. 1994;78(5):599-602. Wolverton SE. Traditional Immune-Modulating Drugs. In: Gaspari?AA, Tyring?SK, eds. Clinical and basic immunodermatology. London: Springer; 2008. p.?551-9. Brandwein M, Nuovo G, Ramer?M, Orlowski?W, Miller?L. Epstein-Barr virus reactivation in hairy leukoplakia. Mod Pathol. 1996;9(3):298-303. Leite RS, Marlow NM, Fernandes?JK, Hermayer?K. Oral health and type?2 diabetes. Am J Med Sci. 2013;345(4):271-3. Milagres A, Dias EP, Tavares Ddos?S, Cavalcante?RM, Dantas?VA, de Oliveira?SP, et?al. Prevalence of oral hairy leukoplakia and epithelial infection by Epstein-Barr virus in pregnant women and diabetes mellitus patients — cytopathologic and molecular study. Mem Inst Oswaldo Cruz. 2007;102(2):159-64. Greenspan JS, Greenspan?D. Oral hairy leukoplakia: diagnosis and management. Oral Surg Oral Med Oral Pathol. 1989;67(4):396-403. Lozada-Nur F, Costa C. Retrospective findings of the clinical benefits of podophyllum resin 25% sol on hairy leukoplakia. Clinical results in nine patients. Oral Surg Oral Med Oral Pathol. 1992;73(5):555-8. Gowdey G, Lee RK, Carpenter?WM. Treatment of HIV-related hairy leukoplakia with podophyllum resin 25% solution. Oral Surg Oral Med Oral Pathol Oral Radiol Endod. 1995;79(1):64-7. Moura MDG, Guimar?es TRM, Fonseca LMS, de?Almeida Pordeus?I, Mesquita?RA. A?random clinical trial study to assess the efficiency of topical applications of podophyllin resin (25%) versus podophyllin resin (25%) together with acyclovir cream (5%) in the treatment of oral hairy leukoplakia. Oral Surg Oral Med Oral Pathol Oral Radiol Endod. 2007;103(1):64-71.Bhandarkar SS, MacKelfresh J, Fried?L, Arbiser?JL. Targeted therapy of oral hairy leukoplakia with gentian violet. J?Am Acad Dermatol. 2008;58(4):711-2. Greenspan D, De Souza YG, Conant?MA, Hollander?H, Chapman?SK, Lennette?ET, et?al. Efficacy of desciclovir in the treatment of Epstein-Barr virus infection in oral hairy leukoplakia. J?Acquir Immune Defic Syndr. 1990;3(6):571-8. Walling DM, Flaitz CM, Nichols?CM. Epstein-Barr virus replication in oral hairy leukoplakia: response, persistence, and resistance to treatment with valacyclovir. J?Infect Dis. 2003;188(6):883-890.